In the end, total sea ice volume grew by 373 km3 during April, which is the largest increase in the 2007-2018 period, almost 200 km3 above average. This means that the gap with years that had more volume than 2018 has become smaller, and the gap with 2017 -the only year with less volume than 2018 so far - has grown some more. In fact, 2011 has swooped below 2018 by 3 km3. It's safe to say they're on a par, but 2016 isn't that far off either, and, of course, 2012 is about to have some very large drops. The fact that they are both in agreement, is also an indication that less snow has fallen on the ice than last winter, because this tends to make CryoSat deviate from PIOMAS. I'm saying it because this snow may have played a role in last year's lack of preconditioning during May and June, and thus the remainder of the melting season as well. If weather conditions are detrimental to sea ice in the Siberian seas, sea ice volume may drop to low levels this melting season, as that's where more volume seems to be than on average in the last seven melting seasons. Right now those regions are seeing quite a bit of sunshine due to open skies, and temperatures are anomalously mild as well, but it's just the first week of May and so we can't say anything definite about it for now. What we definitely can say, is that with the volume maximum behind us now, the melting season has officially started! I'm looking forward to see what the Arctic has in store for us this melting season. For everyone who did not monitor the Polar sat pictures, the regular Mid-April clouding over of most of the Arctic Ocean has happened, that was and is good news, it is a slow starter, but from a second lowest maximum volume, sea ice needs all the good news it can get, which will likely not come until mid June onwards, for a little while. Not a surprise, the GFS doesn't consider horizontal optical data at all. which is fueling warmth over a vaster region (the Arctic Ocean), in particular when cyclones are blocked from coming from the North Atlantic. Grasping this is called met or climate 101 for adults with a serious bent in learning. Dramatic decline in Arctic sea ice extent over last week. Two weeks ahead of 2012 as of May 11. Arctic weather forecast shows more above normal 2-meter air temps on the way. But is the ice loss driven more by air temperature or by influx of warm ocean water temperature? What is a good source to see forecast Arctic ocean water temps? Still early of course, but Neven and others have commented on the importance of spring melt pond conditioning ahead of the main summer melt season. 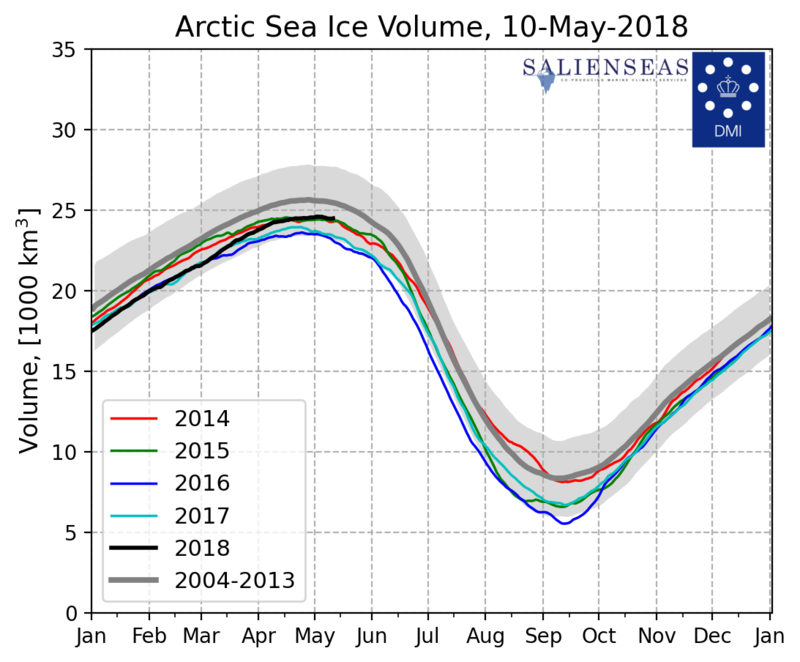 From the looks of it so far, this may be an echo of 2007 and 2012, for another big dip in ice extent and volume unless June-August weather brings a relatively cool summer. Personally, I think it's the worst May I have seen so far (but I would have to check my writing in May 2012). Of course, this can flip within days. But things couldn't be much worse for the ice than they are right now. If we see this kind of prolonged weather conditions in June, let alone July, there's no telling what might happen to the ice pack. Thank you for another great sea ice volume update Neven! Regarding the anti-cyclonic weather pattern: Remember that in 2016 anti-cyclonic pattern persisted until the end of May, but still the cyclones arrived in June and persisted for much of the summer period. As said earlier: With significant temperature increases on the continents and relatively high sea ice volume in the CAB, chances for a return to cyclonic weather patterns should be high - once temperatures have gone up a bit further in the next couple of weeks.. Yes, and this probably helped 2016 come in second lowest after all (in combination with some big cyclones in August, here's the 2016 overview). I'd say the high pressure is more widespread and higher later into the month than it was in 2016, but it's close. And we still have some ways to go until the month is out. The 10-day forecast isn't looking all that great, though, even if it has improved somewhat. But you're right that June may be even more important. "But is the ice loss driven more by air temperature or by influx of warm ocean water temperature?" Snow is very major but poorly mapped, thinner sea ice mix with thicker configurations as well. And there is plenty more factors. It is hard to say with the surface data we have, but it appears that Arctic Ocean cyclones are still warmer than the High pressure over the gyre, of interest is when these temperatures will be equal, then the switch should happen when cyclones cool surface air instead. NSIDC 2016 September average extent was 4.7M km2. But it seems like two more warm winters (2016-17, 2017-18) since 2016 melt season must have "softened" up the Arctic sea ice to be more sensitive to summer melt in 2018. Wipneus linear trend for Sept. mininum volume shows 2018 at about 4.2 km3. That would be put 2018 about tied with 2011 for second lowest above the dramatic 2012 record. The 2012 new low record had a lot to do with August storm, so I guess we'll just have to see what kind of weather summer brings to the Arctic this year. Will be interesting to see the spread among the September minimum predictions from the various models. It seems the conditions for Fram export are getting worse, both for ice coming from the Siberian and the Greenland side. But is there actually such a data trend, or is it just born from the fact that the Arctic Ocean used to be frozen further to the South compared to now? "Yes, and this probably helped 2016 come in second lowest after all"
I would disagree: 2016 already by far had the lowest SIE coming into May and the anti-cyclones in May only kept the difference in place, until cyclonic weather patterns got in place and slowed down melting overall for the remainder of the 2016 season. 2013: The first cyclone only formed in earnest by May 25th after which the cyclonic weather pattern dominated most of the remaining melting season. Therefore, the 10-day forecast does not worry me much (today). What I am worried about, is the combination of higher than average temps across the CAB, while northernmost Siberia is colder than average. If northern Siberia does not heat up, then the necessary depressions may not form in the northern part of the Urals and the coming melting season could look more like 2007 and 2012 with significant high pressure areas over the sea ice during summer months. Well I am becoming increasingly freaked! I have it in my head that low solar played a part in the last spate of record lows across the basin and any return of the synoptics driving them will certainly leave the basin in a mess! If the same processes that leads to the observed increase in northern blocking in the Atlantic,over winter through low solar, migrates north as the sun crosses over the equator then we may have a pattern of solar forcings for melt seasons? Low solar leaning toward HP dominance and high solar bringing more cloudy, and so cool, conditions? Of course it would be a background forcing with other events , like the WACCy snows of west Siberia last year? impacting the weathers locally. The recent papers looking at ocean ingress into the basin is also a worry when we look at the SST's of those waters in Fram and Bering. This is not 2012, we have weaker, younger,warmer ice and ocean entrances pouring ice melting heat into Chukchi/Beaufort and Barentsz/Kara. All we can do is pray we drop off the 'perfect melt storm' pathway before it's too late! Nothing so far this year has disabused me of the notion! "We find that this decline has caused 6.4 ± 0.9 W/m2 of radiative heating since 1979, considerably larger than expectations from models and recent less direct estimates. Averaged globally, this albedo change is equivalent to 25% of the direct forcing from CO2 during the past 30 years." Source: Observational determination of albedo decrease caused by vanishing Arctic sea ice. Sorry, I don't know how to paste image into comment, so here is description in case you can't reach the links. Figure 1 shows change in clear-sky albedo between the mean of the last five Septembers (2007–2011) and the mean of the first five Septembers (2000– 2004) of the CERES record. Results for March-August are included in Fig. S1. (Supplemental file also online). It shows albedo decline of about 10% for small areas of the Arctic ocean for March-May. For June and August, area of 10% albedo decline covers about half of Arctic ocean. For July the whole Arctic Ocean is affected, with about half of it at ca. 10-15% albedo decline, and the other half roughly 5% decline. September similar to June, but different locations. Graphics more impressive than this description. Would be interesting to see values updated from the 2007-2011 period covered in the study. I have made a stunning snow temperature measurement 2 days ago, some -4.3 C below surface air temperature 2 meters above, with sun 20 degrees high shinning on the surface of mixed snow layers, fresh on top, harder below. This is very interesting Wayne - especially how the cold zone around Laptev may impact circulations.. I do not see yet on ecmwf forecasts that this melt pond creating pattern is changing. I will need to dig a bit deeper to find reasons for remaining optimistic about this melting season.. The ECMWF forecast is actually looking somewhat better (for the ice) than it did a few days ago. The high pressure isn't as high, going below 1030 hPa again in a few days, and instead of covering almost the entire Arctic, it gets restricted to the Beaufort Sea. But it hasn't been good so far. And according to GFS temps will remain anomalously high. June is going to be very important. Hmm, for the last day of the medium range ECMWF forecast (5/26) small lows remain around Ural and Hudson Bay, while a broad high extends from Beaufort to Barents..
Are you looking at a different forecast Neven? It's the same forecast, but it has changed again. I tend to check out the ECMWF forecast on Tropical Tidbits, because it shows highest and lowest pressure of systems. There's not much use looking beyond D6, because the forecast becomes very volatile from one day to the next (as we see today, for example). The ECMWF SLP forecast is looking a bit worse again now, with high pressure remaining relatively high and quite extensive. D7-10 has the high pressure moving over to the Siberian side of the Arctic, but forecasts that far out tend to be volatile, and so there's no use in posting them. ECMWF is usually very good except for the Arctic, which has sparse data from many of its regions. On frequent occasions it shows quirky movements. Right now my own projection outlook of last month stands very sound, but I am cheating, I use data no one else has. The high over the CAB has been diminished somewhat in the past day, but forecasts still do not look great with the high remaining above or near the CAB for the coming week..
Whilst the weather is not (yet!) impacting sea ice too much it also seems that the distribution of sea ice with more than usual volume in the central arctic area favors low early season melting. The Scandinavian peninsula has seen an abnormally persistent high in the past couple of weeks (And is forecast to remain at least another week). Due to this pattern of colder/low energy content air masses arriving in Siberia, there is less chance of a persistent low developing that can move across to the CAB as seen during most melting seasons of recent years. Latest refraction measurements shows a very small incremental warming of the entire atmosphere. Here’s an interesting piece of amateur Citizen Scientist research solving (?) the deep mystery of the consistent 16–18°C SSTs off the west coast of Svalbard. Following questions raised about this all over the Forum and social media, my first though was to contact the proper authorities, that is, the authorities assumed relevant *before* I knew the answer to my question. My letters containing high–resolution SST maps were swiftly dismissed as being in error, as both the Met.no and Polar.no were in possession of *low–resolution* SST maps, where said extreme temperatures didn’t occur. Problem solved, it seemed. A concerned citizen asking questions about something out of the ordinary must simply be wrong, otherwise we would have known about it already. Well, not being known to give in easily, I went over to NOAA to find the corresponding SST map archive for the extreme hotspots showing up on Earth.Nullschool. 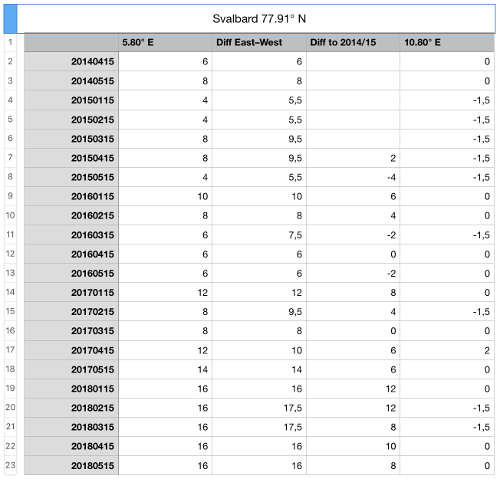 When I took some samples and systemised them in a table, (displayed here), I quickly found that all through winter the contrast to 5° closer to the coast of Svalbard was 16–18°C in favour of the hotspot to the west, and that the diff to the same time of the year in 2014–15 was 8–12°C, meaning this is a very local heating up of the top of the ocean, and it’s very recent and extremely persistent through all the dark winter months. The extreme temperature differences and the stable temperature of the hotspot led me to exclude everything but geothermal / volcanic causes, as I’d also seen the bathymetry out of curiosity on the standard Google Maps view, turned to ‘Satellite’ mode. Then it was just a matter of Googling for Svalbard and volcanic, et voila. Hundreds of volcanoes and black steamer chimneys discovered as recently as this decade, among them Lokeslottet, or Loki's Castle. Despite not living up to your nickname, I wish to congratulate you on this very important finding. If you are right, that this is indeed an SST manifestation of a geothermal vent, you have most likely demonstrated that the AMOC has come to a halt off Svalbard. The implications for the Arctic (and the global climate) may be severe, but you have once again demonstrated that Nevens Blog is alive and kicking. I understand that ash and aerosols cast into the atmosphere by volcanic activity can have climatological consequences due to albedo effects, but can the heat released by these eruptions have a similar effect? It was always my understanding that the heat from volcanoes was insignificant compared to the planet's overall thermal budget. By "vulcanism" I also refer to surface manifestations of releases from deep geothermal vents. I bring this up because AGW skeptics are already bringing this up as an alternative explanation for Arctic warming and sea ice loss. I'm not sure I understand you. You say that "Hundreds of volcanoes and black steamer chimneys discovered as recently as this decade, among them Lokeslottet, or Loki's Castle." OK, so if they've been there a decade or more, then why is this the case: "the diff to the same time of the year in 2014–15 was 8–12°C?" Is there an observable change in activity level or something of the sort? I believe the answer is already included there, in your question. In a word: Yes. There are numerous deep sea geothermal vents in that area and they have been recently active. The fact that sea surface temperatures have gone up dramatically in that area is an indication that the deep sea currents that normally circulate these plumes have failed, allowing the hot water to rise to the surface. In other words, the rise in surface water temperatures is not necessarily a cause or result of ice cover in the Arctic Basin, but an indicator of a breakdown in the deep ocean heat exchange "conveyor belt". would you say you are more baffled by what I mean, or by what you mean? I like the italicised narrative, but I believe that to be your narrative. Implying that mine is different from yours. So, if your question is really whether my narrative equals yours, then the answer is no. Simple as that. I believe mine is still available above, so if truly curious about its contents, it can be read again. Perhaps you misinterpreted my comments. I am not trying to contradict, challenge or embarrass you. I am simply trying to determine if the observed rise in SST is a result of recent increased geothermal activity, OR, is it caused by an interruption of the AMOC (as alluded to by P-Maker). If I'm not mistaken, (he may correct me if I am) I feel that is the same ambiguity that Mr McKinney refers to. My motivation for this question is not to present you with a "gotcha", but to determine the significance of your observation. A sudden increase in geothermal activity would (in my opinion) not necessarily have any climatic consequences. An interruption in the AMOC certainly would. when you have ocean surface temperatures on a latitude almost on the northern beaches of Greenland at +16–18°C in mid–January, at 16–18°C in mid–February, at 16–18°C in mid–March, at 16–18°C in mid–April and at 16–18°C in mid–May of the same year, most science literate people on this planet would agree that something out of the ordinary is happening. Even something out of the ordinary for a rapidly warming planet. After doing my homework in terms of some amateur Citizen Scientist research, I’ve concluded that the most likely source of this extreme and mid–winter heat is a local one, from the seabed, based on the very active nature of said seabed. Now, you may (all) of course challenge that conclusion, but I don’t see you doing that. You’re not coming up with better explanations for this extreme ocean heat. I’m simplifying–in–order–to–understand when I pose the question of what could possibly cause this extreme surface heat in the middle of permanent dark polar winter. This is because I want to understand that phenomenon. You, on the other hand, seem to be doing the opposite: You seem to be trying to complicate in order to not understand, indeed, you’ve already stated in clear text that you don’t understand what I’m saying. In a word, you’re baffled. Just baffled. Another baffled guy is Kevin McKinney, who seemingly has a theory that volcanic processes are always at a constant level, while real life of course tells us that they come and go, like eruptions in a volcano. Having watched Tyson’s «Cosmos» at least twice, I’m fully aware that any piece of new knowledge will be attacked mercilessly, and so I have no illusions that my presentation of new facts about hotspots west of Svalbard will pass without personal attacks. Let me just say that *understanding* what I presented isn’t as hard as you make it out to be. It’s basically an «X causes Y» proposition. Instead of repeating tirelessly that you cannot understand the «X causes Y» basic logic, you might want to try and challenge the statement, like in a real* scientific debate. *) Of course, the real life history of real scientific debates through the centuries and millennia has been replete with personal and ad–hominem attacks, even murder, but you know what I mean. Have no fear. I think I know exactly where you're coming from now. And at the risk of putting words in Mr McKinney's mouth, I expect he does too. Clueless FM used to be known as Viddaloo. I banned him from the ASIF and from here because of his inability to communicate properly. Every question is an attack, and he is, of course, the modern equivalent of Galileo. I'm banning him again now, and would kindly ask him to not come back again under another name. Egh.... I dunno. Galileo at least had a sense of humor and focused most of his attacks on his childhood "friend", the pope. At least that's my understanding of him anyway. I teach basically graduate statistics and use the data related to this to teach Time Series Analysis. TSA basically uses filters that are some combination of cyclical, trend, and event. Arctic sea ice has a wonderful 12 month cycle and declining trend. Events are difficult to come by, other than 2012 (and this site offers a wonderful explanation). Here is my question, would the temperature anomaly be best interpreted as an event (eruption or heightened activity)? Constant activity would be swept up in the cycle or trend, but this appears different. I am teaching the class this fall and want to make sure I am offering an explanation that makes sense. BTW, I do treat atmospheric CO2 levels as a lagged covariate to teach that. Anyway, rambling on too long, but want to make sure I represent to the students that I teach what the data seems to indicate. Whilst the not-too-strong high has been hovering above and around the CAB, it appears not to have been warm enough yet to do significant damage, although melt ponds must have been formed in Laptev, ESS and Chuckchi in recent days. Tropical Tidbits (Thanks Neven!) finally seems to indicate a more significant low entering from Kara in 6-7 days. Still a bit too far out, but may just get there in time to do good, as it will coincide with DMI 80N temp moving into melting territory. While there is some apparent expected changes, there is still some questions, namely does ECMWF and/or GFS start by being fully informed? The low has now formed around the Jamal peninsula, from where it should move into Kara, then into Barents and towards the Pole, after which it seems destined to linger for a few days - possibly the first significant summer cyclone of this melting season. Lots of discussion on the forums about that Cyclone. Things start getting really exciting over the Eastern Kara and Barents in 36-48 hours. Models are also suggesting over-all surviving arctic snow cover is going to get clobbered hard. Albedo all across the arctic is dropping fast. The storm is actually one of the scenarios (early precipitation stripping snow, increasing heat uptake) we were afraid of and discussed earlier in the forums. From my vantage point, the storm is absolutely necessary in order to limit sun radiation reaching the sea ice and open water in the highest north. Reducing snow cover helps create the temperature difference that sustains the storm above the ice-covered areas. seems slightly more possible after viewing satellite photos IR temperatures which are muddled by cloud temperatures. "From my vantage point, the storm is absolutely necessary in order to limit sun radiation reaching the sea ice and open water in the highest north." That's a thin reed to try and grab ahold of, but I'll take it. To me, it seems about all we have right now. This method of prediction works really well for June data, but even for May data it has some skill. I ran my regression formula on the 1992-2015 training period, using May data for snow cover, ice concentration and ice area, and arrived at a prediction for September sea ice extent minimum of 4.84 M km2. This number makes sense, since snow cover in May was still fairly high (compared to the previous 10 years), and even though sea ice extent in May was at a record low, sea ice area is actually just 3rd or 4rth lowest. This means the ice pack is still fairly 'compact' which reduces the amount of heat the ice pack will absorb from the ever higher sun in the Arctic. Standard deviation over the prediction is 460 k km2, which is substantially better than a linear decline as a predictor (which has a standard deviation of about 550 k km2). So the method has some skill with May data, but for an accurate prediction, please wait for the start of July, when the June data is in, since that has real skill with about 300 k km2 standard deviation. Until then, the prediction of 4.84 M km2 stands. Darn. The Rutgers snow lab picture is just cut-off for the last year(s). even though sea ice extent in May was at a record low, sea ice area is actually just 3rd or 4rth lowest. This means the ice pack is still fairly 'compact' which reduces the amount of heat the ice pack will absorb from the ever higher sun in the Arctic. I updated my NSIDC compactness graph yesterday, and also noticed that compactness is relatively high for the time of year. I had expected it to be lower because of all the clear skies during May, but apparently it was still too cold for some serious melt ponding to occur. For the sea ice volume distribution this year, it seems to me we have not in the past had quite this setup with such high volume in the CAB and very little volume in peripheral seas. Weather has not been greatly favorable to the ice, but here it seems like as long we are in negative DMI 80N temp area, the impact is not too strong - or the skies have just not been very clear in spite of the hovering high.. Rob, I cannot quite grasp the significance of snow cover in your formula: It may have worked well in previous times (High snow cover = Cold), but in the new fragile state, it seems like less snow cover helps invoke the steady lows in the CAB as seen in 2013, 2014, etc. Example: 2013 and 2017 melting level seems comparable, but May snow cover was quite different for those two years. Very very clever to use snow as a metric to estimate the minima, but there are a few problems with that, from direct in situe observations, remote sensing has a devil of a time being accurate with especially snow thickness. 2, snow is likely the greatest contributor to melt ponds, although it deflects solar forcing, eventually it melts and causes greater ponds. However , I think it wise to use your method given that one day the satellites will be more precise. for a month and a half. This contribution I call momentum, not easily trifled with, it has a long lasting grasp in the future, so as I wrote in April. sea ice extent at minima should be less than 12, but not by a lot. I am particularly keen on the NE passage being especially open. "minima should be less than 12"
minima should be more than 12, everything can easily change if there is a peak solar forcing Arctic Dipole, the joker in the game of predictions. It's PIOMAS time again - confirming what we have seen these past few weeks. Looking forward to your update Neven! I therefore do not see any way that this year will be in competition with the record 3.6 mio km2 average Sept SIE in 2012, but it will be very interesting to see, how the ice will fare in Laptev and the ESS, which will have a huge impact by Sept.
JAXA reports 600,000 km2 more sea ice in 2012, may be your thickness has been muddled by snow and ice complications? Usually when there is less sea ice extent , there is less ice... Melt ponds are tricky little fellows, if there is a lot more snow cover, water may be under the snow, and not appear on sat pics. Greenland being colder is completely what I would expect since measuring coldest CAA upper air in 18 years, alas Greenland is not Arctic-land as a whole. The CAA atmosphere has dominated and influenced the circulation patterns mostly on than off since November 2017. Bad news for the North Atlantic sea as we currently notice. No way your extent prediction will come even close... But I agree for another approach in estimating , a very good cooling calamity for sea ice would be needed for your numbers to happen. Prediction of September sea ice extent, based on sea ice area and extent, as land snow cover is now 4.65 M km^2. Standard deviation over the residuals is 470 k km^2, which is still showing significantly better skill than linear decline. I don't know about the "long Gyre current reinforcement". Can you quantify that so we can run a regression analysis over it as a predictor for Sept SIE ? But I DO know about " the presence of dark seas more prominent". It is part of my estimation formula in the form of sea ice area. In general, the smaller the 'area' the lower the albedo, which correlates with lower September SIE in my method. So are melting ponds and boundary ice (extent minus area). Snow thickness (over ice or over land) does not affect albedo, so there is no physical reason to include it in the regression formula. It would just introduce a new variable which will increase the risk of (statistical) "over-fitting". "With four parameters I can fit an elephant, and with five I can make him wiggle his trunk." So we want to include enough variables to make a valid prediction, but not a single variable more. I use three variables in my prediction method (that all affect albedo and thus absorbed solar energy in the Arctic) : sea ice extent, area, and land snow cover. good question on how to quantify, it is essentially the compaction rate, which necessitates full knowledge of thinner sea ice in the intermix, of sea ice pans, the greater the extent in thinner sea ice, the likelier it would melt an its area be compacted. 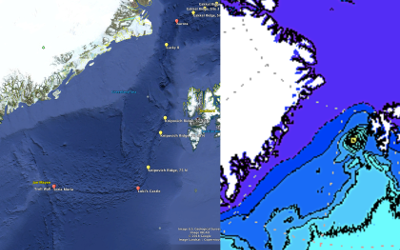 There are a few websites which may offer an idea on how much thinner sea ice extent there is. "Snow thickness (over ice or over land) does not affect albedo,"
It does not in winter, but if there is a lot of snow the albedo will be the same but the melting, water under snow, has started the melting process. I have been caught a few times walking on apparent snow on ice when in fact it was snow on top of water on ice. There was no way of identifying where it was from close by or afar. If you check my latest presentation you will see really dark seas on the Atlantic and especially the Pacific front, with very little broken up sea ice if not at all. True sign of warmer sea water. Sea ice extent is a flaky parameter in itself, as it really tells you very little about having more or less ice - flattening your pancake does not give you more pancake. Extent: Of the period 2012-18, 2012 had the largest sea ice extent from early March to June, but then dropped to the lowest extent of these six years just in the month of June. Area: 2012 also had a large sea ice area during spring and early May, but the area started dropping mid-May indicating a decompaction of the ice pack already in the second half of May setting the stage for the tremendous records in 2012. I therefore agree with Rob on including both area and extent in the parameter definition and also agree that June numbers are much stronger indicators that May extent and area. This plume was fully absent in June/July 2012. Lastly, with the NSIDC calculations redefined, I should probably subtract 150kkm2 so would now have 4.85 - 5.35 mio km2 in V3. I guess the V3 2012 record is now 3.5..